I adore it, I cannot say how much I adore it. The yarn, the pattern, the quickness (took just over 2 weeks). It's splendifferous. I kind of threw out the pattern near the end, because I was getting too caught up in the joys of vertical bust darts that I forgot to BO for the back, so the back is slightly higher and then I had to compensate for that by binding off on the sides more quickly, or else I would end up with a camisole with a neckline more like a turtleneck. But I forgive it for its imperfections, because it's beautiful and I love it. Oh, mint green silky thing of beauty, how I love you. 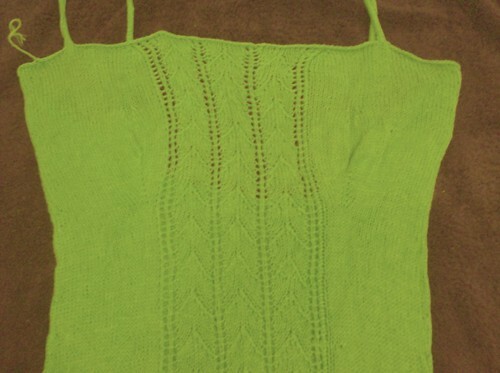 I love the soft green color, and the fact that it is sleeveless, very nice. Very Nice! looks so comfy, and the colors great! It's lovely! Can't believe you finished it so quickly. That's absolutely gorgeous! Delicate, yet strong. And the color is yummy - wonderful! You look lovely! And now I am inspired to try and make that one too. It looks really nice on you.